GHRP-6 is sometimes called growth hormone releasing hexapeptide. 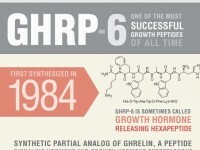 GHRP-6 was first synthesized in 1984. Synthetic partial analog of ghrelin, a peptide signaling hormone and growth hormone secretagogue. GHRP-6 is a rhobust hexapeptide that is unlike sermorelin which is a fragile 44 amino acid analog of endogenous hypothalamic GHRH. GHRP-6 is not FDA-approved and there is little apparent interest in pushing it through the approval process.